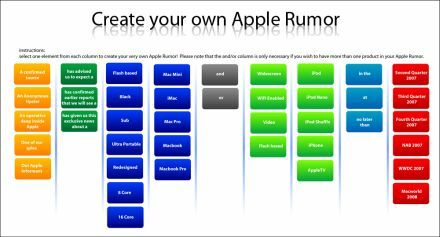 Always insatiable for rumors, the Create your own Apple Rumor tool may not be able to deliver on which coworkers hooked up over the weekend but it will provide the same level of disappointment knowing that you weren't one of them. The tool spits out Apple rumors just as easily as the blogosphere and waits for anyone to swallow. Hooking the bait with such classics as "An operative deep inside Apple has confirmed earlier resports that we will see a Redesigned Mac Pro or Wifi Enabled iPod Shuffle at Third Quarter 2007" and "A confirmed source has confirmed earlier resports that we will see a Black Mac Mini or Flash based iPod at Third Quarter 2007" the tool let's you try and beat Engadget and Gizmodo to the proverbial punch. Now only if they could make an iPhone specific one... Oh, that's Technorati.